I’ve always LOVED designer bags! Growing up my mom and grandma always used designer bags and I remember playing with them and wishing I could have one of my own one day. Although they can be a big investment, I consider them timeless pieces that will stay apart of my wardrobe for years to come. Some of my favorite designer bags to buy are Celine and Chanel and I often buy them from places like Trendlee (this bag I’m wearing is my latest find and I’m in LOVE with the gold and rich bordeaux combination!!). Trendlee is a online boutique where you can buy and sell luxury preowned designer handbags for a fraction of the cost! I’ve used them before to both buy and sell and I totally trust that they’re real and authentic. Bags are such a major part of my wardrobe, especially designer bags because they hold their value and last forever! You can see my collection of my favorite Trendlee bags here! And enjoy 5% off on your next purchase using code PINKPEONIES. Now here’s a guide that I need! Trendlee sounds like a great source to look for affordable designer bags! Thanks for sharing your tip! I’ve heard of other designer resale sites but never this one – so checking it out! I love the color of the bag you chose here! Awesome! Never heard of this so thanks so much for sharing! Always love your chic looking casual outfits! I have always wondered if people pay full price! Thank you for sharing this site! Beautiful outfit! I Love everything about this look :) Especially how the Bag stands out and is the focal point of the outfit and pictures. Great job styling it!!! I will have to check them out I have never heard of them before. Oooh it’s absolutely gorgeous!!! The colour is stunning! Gorgeous gorgeous bag! Love the heels too!! Love that bag! I definitely have to check out Trendlee. I love that bag! I have never seen a Chanel bag like that before but I totally love the color! Killer heels, girl! And obvi I’m super envious of your Chanel! Awesome idea!! Thanks for sharing one of your sources to find great bags! I love this simplicity of this look with those heels! I’m going to check out Trendlee. Sounds like a great place to purchase designer bags! I love the lipstick color you are wearing here, can you please share which one this is? I’m looking for a good berry color one and this looks like a great shade! Thanks. Who knew! I will have to go check out Trendlee. That bag is simply stunning! I will try it! They seem to have great bags! Such a pretty color of your bag! Great find! Oh my!!! 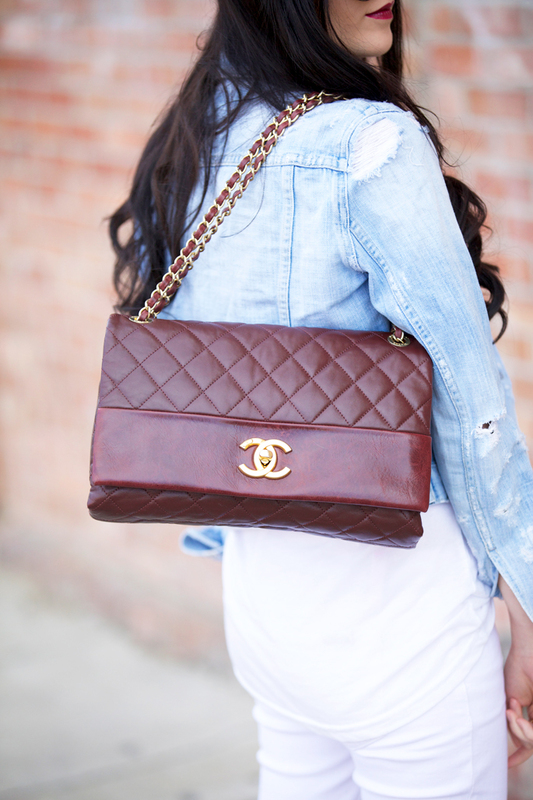 That Chanel is my dream bag!!! You look gorgeous! That bag is gorgeous! It really pops against the white denim! I’ll have to give Trendlee a try. Thank you for suggesting this site! 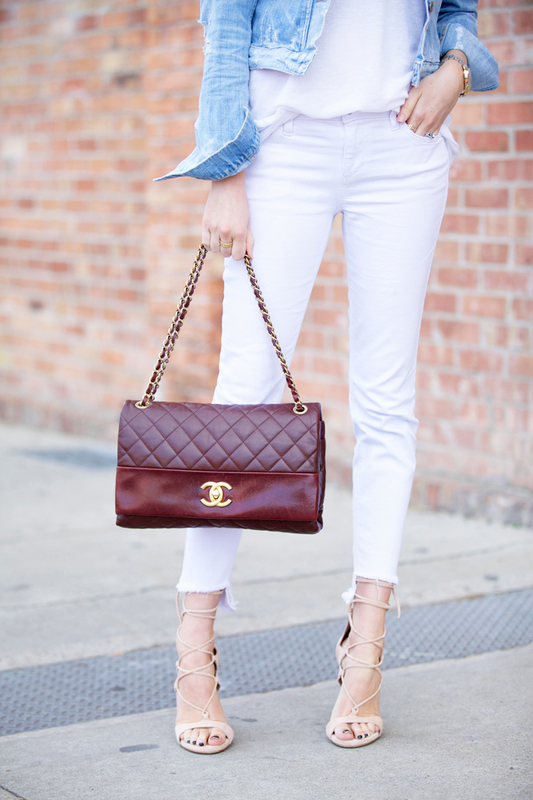 Love the Chanel bag, it’s such a pretty color! I’ve never heard of that site, but I will surely check it out now! Rach, your look is so perfect to showcase your new bag! The white on white really makes the bordeaux pop! I have always loved rich fall colors and this is a perfect way to wear them into spring. And I love how your lipstick is always the finishing touch!!! 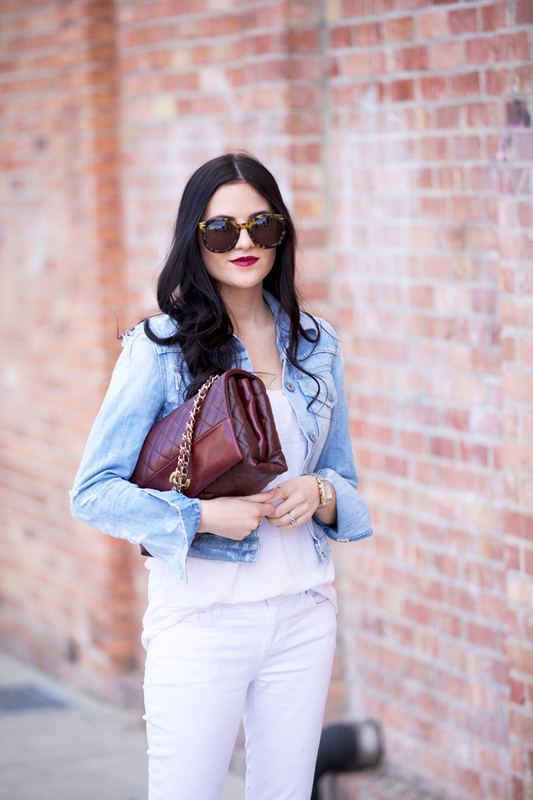 Loving these crisp white denim and the dark burg bag! Stunning look! Thanks for the tip! Need to have a look at their website! This is great to know! Thanks for sharing! Love that bag! I agree that the investment is worth it! I LOVE that color, gorgeous bag. That Chanel is major. I love leather bags in rich jewel tone reds like burgundy. I recently bought a Valentino Rockstud tote from Trendlee that I’m really happy with. I’m a careful shopper after some bad experiences and stick with sites that authenticate the items they sell. Designer bags… le sigh! I bought my first Chanel and Chloe last year. Now I’m hooked. They are definitely an investment, but I wear them all the time. Love this easy outfit you’re wearing here. Love your bag! This outfit is stunning. And thanks for sharing about Trendlee! What is this lipstick color!! SO gorgeous!! Love this find! I’m such a huge fan of designer bags and definitely think of them as investments. That is a seriously gorgeous bag!! That back is gorgeous, and this outfit is super cute, I’m in love with those jeans. I’ll definitely check out Trendlee before I purchase my next bag. The Chanel color is gorgeous! Hi Rachel! My name is Emily and I’m a 15 year old, and a HUGE lover of your blog for a while and I love all of your outfits and fashion sense. However, being only 15, I realize that some of these items are a big investment for someone my age, so I was wondering what your first big fashion investment was when you were my age and also what your first designer bag was as well! Thanks so much Rachel, I love your blog and your family. XO. I’m currently obsessed with all things Chanel. I really really love this bag. The color is so beautiful. Thanks for sharing the website! I am like you. I love designer bags! They are such a great addition to your outfit and can really pull the whole thing together. Finding the perfect bag can sometimes be difficult but can really pay off once all the searching is done!